As organizations seek to drive down product and process variation they implement Statistical Process Control, Lean, JIT and or Six Sigma. Another very powerful set of tools lie in Design of Experiments. 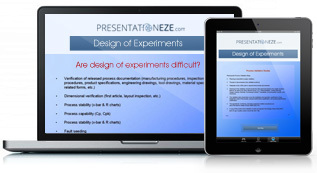 The statistics associated with design of experimentation need not be overly difficult. It does take time and resource allocation, however, the rewards far outweigh the costs (time, people, equipment, etc.). 7) Repeat until you achieve a Cpk of 8 or better. DOE or Design of Experimentation is about identifying the potential causes of variation, and, performing a structured experiment to see the impact of changes in the relative levels of the potential sources of variation. DOE has many forms ranging from Taguchi through to Shainin. Taguchi tends to be seen as very complex, requires significant training and remains in the realm of the DOE Engineer. Shainin’s approach is significantly simpler with fewer experiments and a capability of performing DOE within the realm of the trained process supervisor. However, such approaches still prove quite complex for many involved in working to reduce product and process variation via design of experiments. The results can also remain disappointing. The Level Factorial Method © is a simpler method, compared to other DOE methods currently in use, yet provides the capability to identify root causes of variation, with a simplicity which belies it’s power. You still need to identify a range of potential causes of variation. You will still need to perform experiments. You will still need to assess results to ascertain their true impact on the actual product or process. However, the key to the Level Factorial Method © is the fact that fewer experiments will be needed, less time is required on performing actual testing and the results obtained are superior to those of other methods.